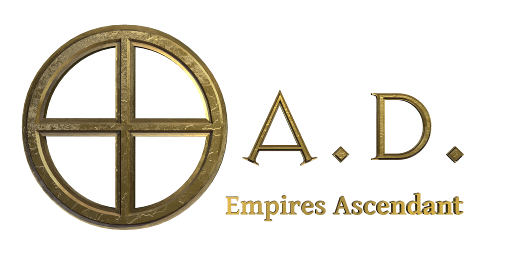 Delenda Est works to bring authenticity to the in-development indie title 0 A.D. Empires Ascendant. Delenda Est molds the game into a coherent focused design, adds features, new art, and new civilizations, and serves as a testbed for new ideas that could potentially make their way into the core game. 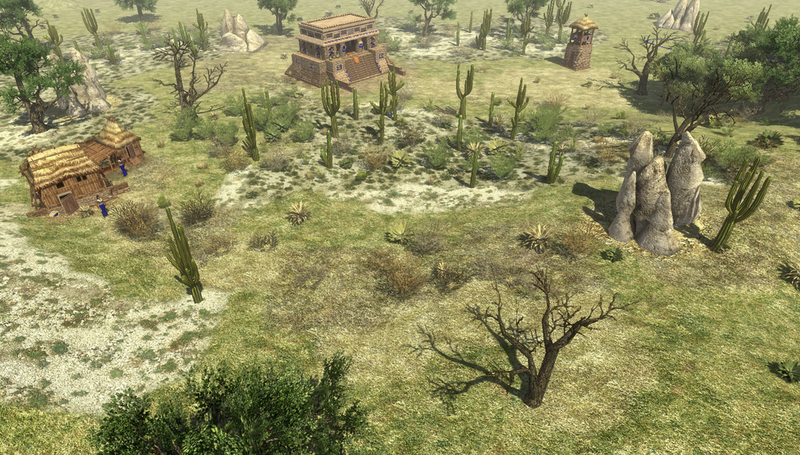 Delenda Est includes all-new unit balancing, all-new technology trees customized for each faction (with technology choices and unique techs), new buildable structures (cult statue, archery range, stable, workshop) new playable factions (Han Chinese, Theban Greeks, Epirotes, Imperial Romans, and the upcoming nomadic Scythians for Alpha 24), modded maps, brand new maps, capturable mercenary camps with dozens of new mercenary units, farmlands that enrich the player's food production, a brand new resource (Glory), and much much more! Build a Wonder to auto-research this new final phase and unlock unique technologies. Citizens: Build economic buildings and gather resources very slowly. They have a "Slave Ownership" aura which boosts the gather rates of nearby "slave" class units. Slaves: Are purely resource gatherers. Trainable from Storehouses and Farmsteads after constructing a Market. For Alpha 23, all factions have slaves for balance. Other "socio-economic" paradigms will be explored for Alpha 24, for instance the Indian caste system for the Mauryas. Citizen-Soldiers no longer gather resources. Can build Military buildings and help the civilian Citizens with building other types of buildings. Since they are also "Citizens", they too have the "Slave Ownership" aura, which boosts nearby Slaves. Nomads - Huns, Scythians, Xiongnu: Movable buildings. Three new factions, currently unfinished, but playable. Artwork by Stanislas, AlexanderMB, and wackyserious. Can "pack" their buildings and move them across the map. Do not have territory bonuses or restrictions. They can build anywhere. Have a strong bonus in cavalry, but weak buildings. Artwork by Stanislas, AlexanderMB, and others from Terra Magna. No access to cavalry, but have strong infantry. Ball Court special building acts like a strong Cult Statue, that trickles a good amount of Glory for the player. Principate Romans: The classic "Imperial Rome" of the 1st and 2nd centuries A.D.
Start each skirmish match with a free Temple of Vesta. Have a Legionary Barracks and an Auxiliary Barracks. Their wonder is the famous "Flavian Amphitheater", or better known as the Colosseum. Like the Republican Romans, the Principates have the Army Camp and Siege Walls. Artwork by the Terra Magna team, used with permission. The Minister unit boosts the effectiveness of buildings he is garrisoned inside and of nearby Peasants (Civilian Citizens). Construct the new Imperial Court building to advance to Town Phase (II) and train more Ministers. Construct the new Cult Statues in order to advance to City Phase (III). Epirotes: An imperialist Greek civ with a variety of ethnic units, lead by the famous Pyrrhus of Epirus! Unlock training Champions from the Barracks (a feature removed from all other civs). Towered War Elephants. 'nuff said. Has access to a wide variety of troops, from many different ethnicities. Theban Greeks: The ancient and storied Thebans, from central Greece. Construct the Theban Fire Raiser siege weapon. Train the famous Theban Sacred Band from the fortress. They start each skirmish match with a free Greek Stoa, which increases building health by 20% for as long as it stands. Build these to gain a trickle of the new Glory resource! Task soldiers and civilian alike to it to gather additional Glory. Glory is used to train Heroes and Healers, research special technologies, and research Temple technologies. Greek factions receive a free Greek Stoa at the beginning of each skirmish match. Grants +20% health to all buildings for as long as it stands. For the Han Chinese, unlocks the Town Phase (II). Train Ministers, who help boost the player's economy. For those factions with more than 1 warship, it constructs warships. Split from the Dock, which is now purely economic for most factions. Mercenary Camps, in the form of either a desert encampment, a small village, or wooden stockade, are neutral, capturable structures dotted throughout skirmish maps. Capture them to train Mercenaries unique to each faction. Train very quickly, in usually only 5 seconds. Mercenaries cost no food, only metal and one other non-food resource. Most start out at the Advanced rank. Can only train 30 mercenaries for the first captured Merc Camp, and 10 more for each other Merc Camp under the player's control. They're back. Streamlined and (mostly) realistic. So every unit is good for something. "Massed Pikes" aura for pike infantry gives them additional attack and armor for every nearby pikeman, making the Syntagma formation more useful. "Locked Shields" aura for hoplite infantry give them a big armor boost when near other hoplites, making the Phalanx formation more useful. Wedge formation for cavalry boosts their movement rates by 20%. Forced March (the old 'Column' formation), boosts movement rates by 15%, to get your troops across the map swiftly. New Technologies and Technology trees. 100 new technologies, with some new icons. Each faction's Blacksmith has a unique tree. Many skirmish maps have areas of terrain where building farms on them will increase the output of the farms by 100%. Consequently, Civic Centers and Temples have the "Civic Spaces" aura, which reduces output of nearby farms by -50%. This is a major fix release for the Delenda Est Alpha 23 release. It fixes many bugs in actors, entities, art, and code found in the first Alpha 23 release, and is the most current version of Delenda Est. Notably, the player will see a lot fewer error messages, the AI builds Cult Statues, and all civs now have the "slave" system for balance. Other historically accurate socio-economic systems will be explored in subsequent releases (for instance, the Indian "caste" system for the Mauryas and a "peasantry" system for the Iberians and Persians). Se pueden tener varios mods a la vez dentro del juego?? Imperial Roman catapult can't move even after packed. Is this a bug? Yes, a bug. Working on it, sorry. Look here Releases.wildfiregames.com Delenda ES is under heavy development for the new version. I installed this mod. I saw the new factions, yet the barrack is not divided into those 4 sub barracks. I guess after alpha 24 is finished. Alpha 23b coming soon, this week. I think it could just be the animations for me..
does it happen to anyone else? Testudo was removed due to the unit model/animations overhaul of last year. A WFG team member has worked on new testudo animations for A24 release. Honestly, DE and TM aren't very compatible if both enabled. Release 2 is out for Alpha 23. Has a bunch of fixes. A new "fix" release is now uploaded and should be live soon. 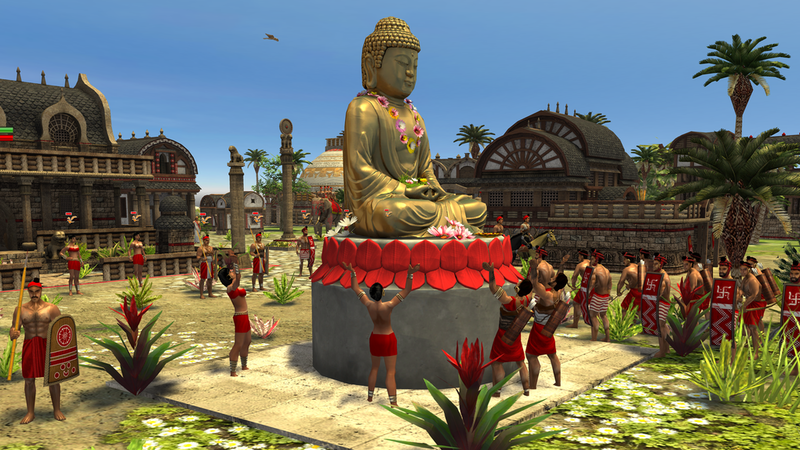 It fixes a bunch of errors present in the first Alpha 23 release and adds some more stuff (it gives the slave economy to all civs for balance and the AI will build Cult Statues now, among other things). It will be versioned 0.0.02 once it's accepted and gone live.